There is naturally much more variation in the physical properties of wild silk than in cultivated silk. For example-may be yellow, grey, brown or green. Seen under the microscope, wild silk may distinguished from cultivated silk by its irregular width. It is also marked by longitudinal striations and tends to have flattened areas on which are transverse markings. These flattened areas are caused by filaments pressing against one another in the cacoon before the material of the silk has hardened. Treatment of the wild silk filament with economic acid will disintegrate it into a bunch of finer filaments, fibrils or micelles about 1 micro in diameter. The same effect can be obtained by severe mechanical or chemical treatment of cultivated silk, in which the fibrils are more closely compacted. Seen in cross-section, the twin filaments in wild silks are wedge shape, with the short bases facing one another. The cut section of the filament is dotted with markings corresponding to the striations running lengthwise through the filament. These mark the boundaries between the fibrils, which are less closely held together than in cultivated silk. Silk is a strong fiber. It has tenacity usually of 30.9-44.1 cN per tex (3.5-5.0 gram per denier). Wet strength is 75-85 percent of the dry strength. Silk filaments have an elongation at break of 20-25 percent under normal conditions. At 100 percent relative humidity, the extension at break is 33 percent. The elastic recovery of silk after spinning is not so good as that of wool, but is superior to that of cotton or rayon. Once it has stretched by amount 20 percent of its original length, silk tends to remain permanently stretched. There is a slow elastic recovery or creep after extension, but the silk does not regain its original length. Degummed silk is less dense than cotton, flax rayon or wool. It has a specific gravity of 1.25. silk fabrics are often weighted by allowing the filaments to absorb heavy metallic salts, this increases the density of the material and affects its draping properties. Like wool, silk absorbs moisture readily. It can take up a third of its weight of water without feeling wet to the touch. Silk has a regain of 11%. If there are salts or impurities in the water, silk tends to absorb them too. Hard water, therefore, will contaminate silk. Degummed silk will swell as it takes up moisture; the extent of the swelling depends upon the relative humidity of the atmosphere. At 100% relative humidity, silk absorbs 35% of its weight of water and increases in cross-sectional area by 46% (from 65% relative humidity). 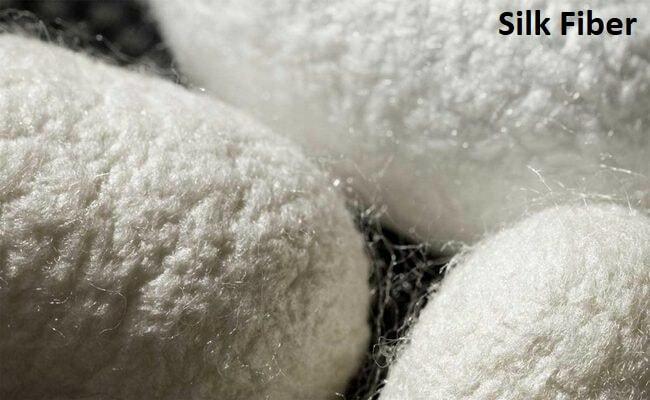 Silk will withstand higher temperatures than wool without decomposing. Heated at 140°C, it will remain unaffected for prolonged periods. It decomposes quickly at 175°C. silk burns, emitting a characteristic smell like that of burning hair or horn. Silk is attacked by atmospheric oxygen, and may suffer a gradual loss of strength if not carefully stored. Sunlight tends to encourage the decomposition of silk by atmospheric oxygen.